Xiaomi Mi5 is a real beast! We know the Xiaomi Mi5 is going to be a looker. But of course the Xiaomi we know won’t release a smartphone that just simply looks good. It has to pack the latest hardware too. And they didn’t disappoint. The Xiaomi Mi5 packs the latest Snapdragon 820 processor, along with 4GB of LPDDR4 RAM and 128GB of UFS 2.0 memory. The Snapdragon 820 needs no further introduction and the UFS 2.0 memory is the new standard and is up to 87% faster than the current eMMC 5.1 storage. This package scores 142,084 in Antutu V6.0.4, a massive number no matter how you look at it. The battery is a 3000 mAh unit. The camera is a Sony Exmor IMX298. It features 16 megapixels, phase detection autofocus and deep trench isolation (DTI) so that the charge from one pixel doesn’t overflow to the adjacent pixel, for cleaner and more vivid colors. Qualcomm Spectra image processor allows you to take 4K videos, while the front-facing camera is a 4MP shooter that gives high level of detail. 4-axis optical image stabilization helps to get shake-free images and videos, even with longer exposures. The stabilization is compared with the iPhone 6s and 6s Plus’ stabilization. Pricing wise, it starts from RM 1297 for the lowest end variant, and goes up to RM 1750 for the highest end version with the ceramic back. 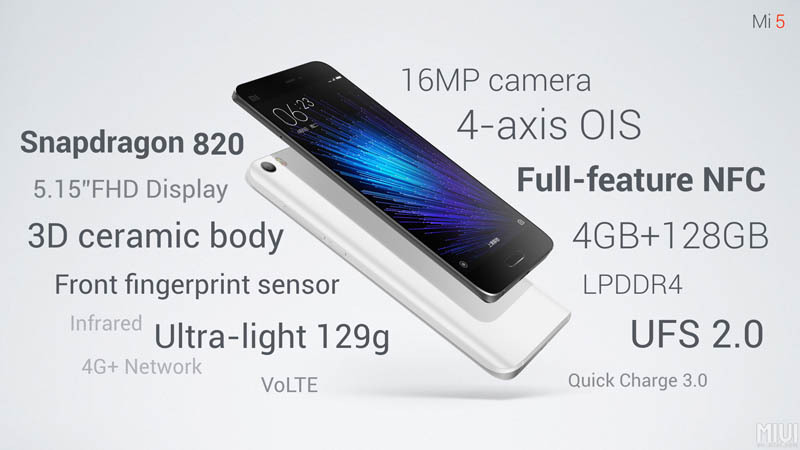 Pokdepinion: I thought the Xiaomi Mi4S was very reasonably priced already, but this definitely takes the cake. This is most probably the cheapest smartphone packing the Snapdragon 820 out there right now. MWC 2016 is coming, what do you want to see?